Full confession: halloween is not my favorite holiday. I like candy as much as anyone else (actually probably more than most) but I just don’t get into halloween. I really don’t decorate and the last time I put any effort into a costume for myself was probably back in college. 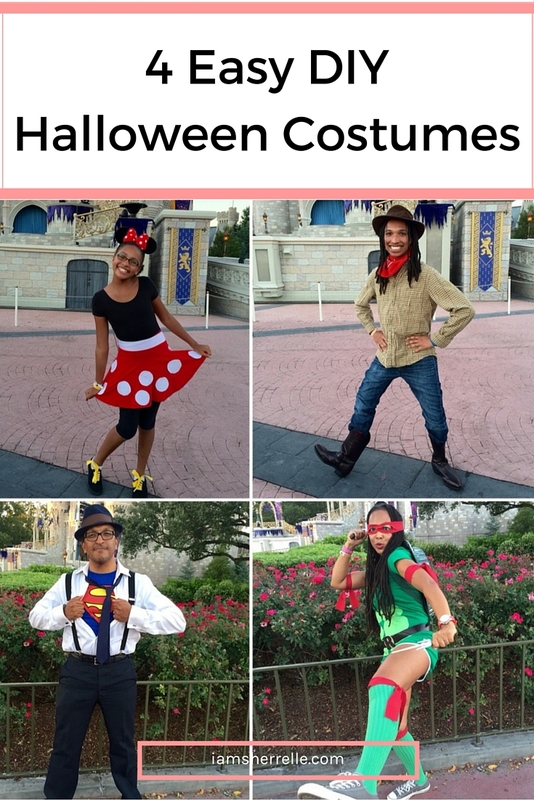 However, this year my family was going to celebrate my daughter’s 13th birthday at the best halloween party ever – Mickey’s Not So Scary Halloween Party in Disney World. If you know anything about me you would know that I either go big or go home, so if we were going to a Disney World halloween party, of course we were going to dress up. And if I was going to dress up, it was going to be excellent. I only have two speeds: I don’t care and excellent. I needed 4 easy DIY halloween costumes and fast. I wanted us to go as a group costume and had so many great ideas, but my daughter only wanted to be Minnie Mouse. And my son based his costume decision on his favorite hat. My husband didn’t even think about his costume until the day before we left for Disney World. I suggested the standard what-I-can-find-in-my-closet costume, a pirate, but he wanted to pretend that he gave some thought to his costume choice. Translation: he wanted me to think of a costume for him that wasn’t lame and shop for it and assemble it the day before our vacation. I was a Teenage Mutant Ninja Turtle. Most excellent. As you can see, all the costumes turned out great! While the Teenage Mutant Ninja Turtle costume was more involved than the rest, it was still only a couple of hours of work. The end result was worth the effort. The rest of the costumes were either no work at all or took less than 30 mins to assemble. black leotard – My daughter’s own. I tight tee will work as well. red skirt – I bought this skirt at Forever 21 for about $10. If you are lucky enough to find one with dots, even better. white felt – I bought at Michael’s for less than $1. I cut the circles and used fabric glue to adhere dots to the skirt. white ribbon for the belt – I bought at Michael’s for $3. yellow ribbon for the shoes – I bought at Michael’s for $2. black tights or leggings – My daughter’s own. Minnie Mouse ears – My daughter’s own from a past Disney World trip, but I have seen them at Target in the party section. plaid shirt – My son’s own. jeans – My son’s own. cowboy boots – My son’s own. cowboy hat – My son’s own. bandana – I bought at a local five & dime store for $1. hat – My husband’s own. dark suit pants – My husband’s own. white dress shirt – My husband’s own. dark tie – My husband’s own. glasses – My husband’s own. suspenders – I bought at Target for $12. Superman tee – I bought at Target for $12. There is a complete tutorial on this blog post. 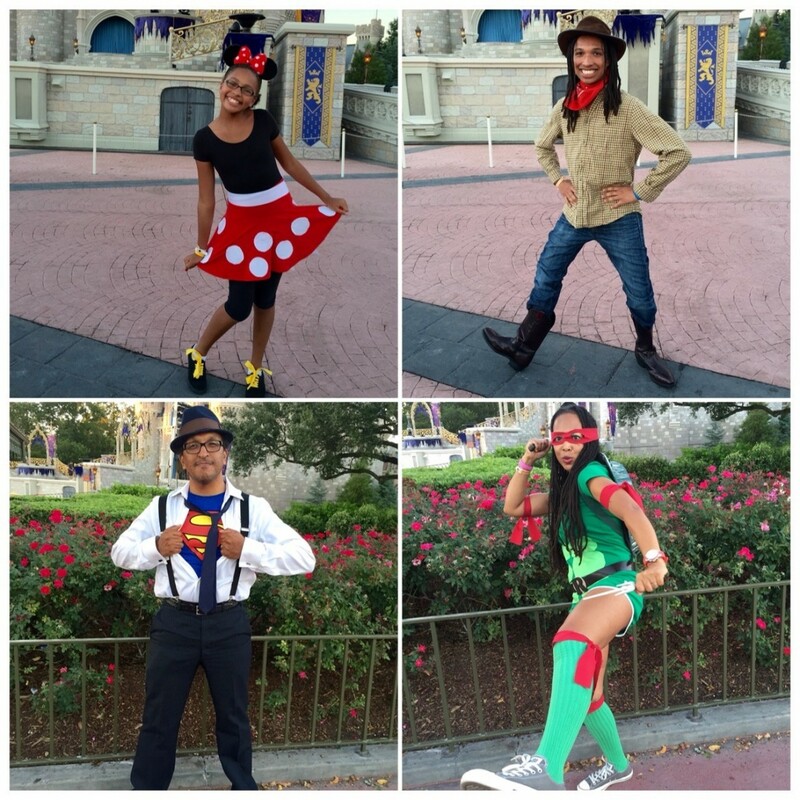 We had a ball at Mickey’s Not So Scary Halloween Party and I loved talking like a surfer, leaping around wielding sai and doing random round kicks, fully in character. Hmmm…maybe this halloween thing is not so bad after all! Funki, you are my hero, inspiration and sorta my mirror (I guess thats why we’re friends). My daughter peeped YOUR daughters costume and guess what? West Coast Minnie twin. I’ll post a pic Friday. Can’t wait to see the photo! Who can blame a young girl for wanting to be Minnie Mouse?